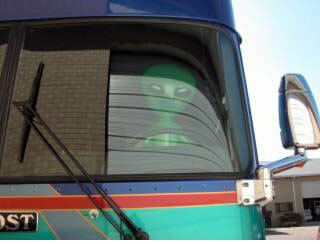 From Carlsbad, we headed for Roswell, NM and the second annual UFO Festival. I had first heard of it from the short-lived WB series, Roswell, about a group of stylish alien teens trying to keep their other-worldly identities secret from government agencies bent on dissecting them, while still managing to go to prom. (I’m a sucker for teen dramas.) As two shrinks, Tim and I eagerly anticipated the UFO Festival as the perfect opportunity to observe weirdness recreationally, without the expectation that we do something about it. The UFO festival takes place over 4 days, but if you’re not an aficionado of all things alien, a little goes a long way. We first went to the Civic Center where, the Duras sisters from Star Trek, Next Generation (unfortunately, sans Klingon costumes), greeted participants at the door. We then entered a large exhibit hall, where a dozen or so authors sat at their booths, hawking books like, Flying Saucers Are Real, Diary of an Alien Abductee, Dear Mr. President: 100 Earth-Saving Letters, Underground Bases and Tunnels: What is the Government Trying to Hide? Also available to answer questions, was the journalist who, as was described in the conference brochure, “retired early to a mountaintop in southern Arizona to explore his relationship with reality.” As an expert of sorts on reality, I could’ve told him that if you have to explore your relationship with it, you probably don’t have one. But, it was only when I turned and came face to face with a large display of the book, Alien Log, that I completely lost it. If you can’t get in touch with your inner 12 year old for that one, I’m sorry; I’m not going to explain it to you. Suffice it to say, I started laughing and couldn’t stop. Tim put his arm around me and ushered me away. He was afraid we’d be stoned as disbelievers. “Don’t worry, honey,” I reassured him. I was by now able to stifle my laughter, but tears still streamed down my face. “They’ll think I’m crying because all this is triggering memories of my own abduction.” He was not placated. We walked over to another booth, where a couple sat and where I made the mistake of glancing at the woman. As soon as I did, she launched into her spiel. One of the most intriguing theories for why aliens have returned to our planet so often and taken so many of our citizens is that we’re someone’s crop. Does make you stop and think, doesn’t it? On our way back to Carlsbad, we passed the Eastern New Mexico State Fairgrounds, just on the outskirts of Roswell. Since we had tickets for the UFO Festival Concert there the following night (Willie Nelson was headlining – you don’t suppose… ? ), we drove the Jeep in to see if there might be a place to park our rig. Sure enough, the Fairgrounds had RV hookups “around back, by the swine barn” (oh, Princess from the Island of Long, how far hast thou fallen?) and we reserved a spot. “What do you suggest? “he whispered back. “Let’s tell ‘em Willie’s sleeping… but we can get them his autograph for $5 each,” I replied. Tim shook his head at me and started walking back to the crowd to explain. “We’ll say it’s for Farm Aid!” I called after him, weakly. Guess we won’t be enjoying diesel on Willie this trip. Take me to your bus converter! This page contains a single entry from the blog posted on July 17, 2004 4:50 PM. The previous post in this blog was How Was I Supposed to Know I Have A Bus Phobia?. The next post in this blog is Chiggers and Humidity and Tractors… Oh, My! .